“So Abraham Went” Sermon 500th anniversary of the Reformation – Habitually Being: thoughts worth living. Truett seminary hosted a preaching conference. All the sermons were to find their basis in Genesis. I preached earlier today, which happens to be Halloween (All Saints Day Eve), and the 500th anniversary of Martin Luther nailing the 95 thesis to the castle church in Wittenberg. My text was Genesis 12 (the whole chapter). Here is the video followed by the sermon text. A friend once told me that in America 50 miles is nothing and 50 years is a long time, while elsewhere 50 miles is a long distance and 50 years is nothing. I saw this well in Korea when I taught English. Mr. Lee, or Peter as he told me to call him was my co-teacher. My first semester he picked me up and dropped me off from school. Once we talked of our homes. We spoke of what an American suburban neighborhood looked like, what it’s like to live in a city compared to a small town. We spoke of his chickens which lay blue eggs, and how he used to work in a big bank in Seoul. I asked what caused him to return to such a small town, one without so much as a movie theater. His response: “Of course I returned. My family has lived in my house for 500 years.” As someone who had not been in a city which had existed for 500 years until I was 21, such an attachment to land was unfathomable. Around the small garlic farming town in which I taught, I could be instantly identified by children I never met. “Mom! Foreigner! English teacher!” toddlers would shout to their parents. There was no doubt of my foreigner status, however privileged or welcome I was. One surely sticks out. And so, it was for Abraham—amplified by a hundred-fold. “By faith he stayed for a time in the land he had been promised, as in a foreign land, living in tents,” the sermon to the Hebrews said, he and his descendants both “heirs of promise.” As Walter Brueggemann notes, Hope required risk, and becoming a foreigner. He was to sojourn in a land which he would inhibit be promised. Sarah, we were told just before, is barren. There is no foreseeable future; there is no human power to invent a future except that God spoke to Abraham. God speaks, Abraham and Sarah go, as Calvin said, “with closed eyes… until having renounced thy country, thou shalt have given thyself wholly to God” As Paul says in Romans, Abraham is the one who “…who gives life to the dead and calls into existence the things that do not exist” (Rm 4:17). The word of God brings forth life, where there was none. Abraham is a picture of faith. Augustine asks, “Was Abraham ever in a position to say to God, “I will believe you, because you promised me that and paid up”? No, he believed from the very first command given.” Going involved renunciation of self, as it does for us. The call is not for Abraham and Sarah alone. There is inclusivity and exclusivity to the call which promises Abraham he will be blessed and be a blessing to all generations. Devotion is to God alone. And the blessing will be extended to all people: those who bless Abraham will be blessed; those who curse, cursed. A sojourner in the land, among Canaanites, amidst temptations to live and provide in other ways, Abraham built an altar and invoked the name of the Lord. On the day of the 500th anniversary of the Reformation, it’s appropriate to note Luther: “Whatever your heart clings to and relies upon is properly your God.” The human heart, said Calvin, is an idol factory. God’s call into the unknown does not always chart for us a clear path. In fact, it may provide anything but. But God’s faithfulness to the one responding in faith is sure. It was 7 years before his first convert. His translations sparked a literary revival in Bengali and other languages. He revolutionized bottom-up missions, and it is because of Carey’s efforts that most Christians in India belong to the “outcasts.” He founded Serampore College, sought social reform to end widow burning, infanticide, and inspired literacy in dozens of languages with full translations in Bengali, Oriya, Marathi, Hindi, Assamese, and Sanskrit of varying quality. He inspired much of the modern missions movement. As Sociologist Robert D. Woodberry, at Baylor University, observed “conversionary protestants catalyzed mass education, mass printing, and civil society–hampering elite attempts to monopolize these resources.” While excesses and abuses existed, in most places leadership is now indigenous– and the people themselves took over the churches, leading to the rise of Christianity in the Global South we see today. Where there was no visible church, God called out new life. Carey had his critics, saying he spent too much time translating Indian religious texts and learning about his environment and not enough time in the task of conversion. Similarly, Korean Christians, like others, have grapple with this same question of how to interact with culture. We’re about a month away from the Fall harvest festival. In Korean, it’s called Chuseok. The Buddhist family I lived with held a traditional observance of Chuseok and the lunar new year, Seollal. At Chuseok, the family lit candles and offered food in front of banners with their lineage on them—the Hong family’s history spanning back to China. They brought me along as they visited their ancestor’s burial mounds, and poured out alcohol and left offerings there. For Catholic Christians, much of this could be appropriated. For the large Presbyterian Korean contingent, some of these accommodations to culture could not be allowed. Bowing in front of one’s living ancestors was a sign of respect. Offerings and other elements of the ceremony, my Presbyterian Korean friends warned were nothing less ancestor worship. Catholics would counter they were only continuing to honor their ancestors after death. The question of how to live faithfully as sojourners is one not just for missionaries, but all followers of God. Abraham’s faithfulness is not all we can see in him. Famine hits. God’s gifts do not seem to provide. He goes to Egypt. Didymus the Blind claims it is not Abraham’s “vice that leads them there but the fulfillment of a divine plan. The virtuous man enters into Egypt in the sense that he makes use of foreign culture to draw something useful out of it,” such as when Paul cites the Greek poet Aratus saying, “for we are indeed his offspring.” Living as sojourners, relationship to “the world” can be complicated—used for good or ill. Didymus thinks Abraham knowingly acted virtuously for God’s cause. Here, I think Didymus gives Abraham a little too much credit. However sympathetic his situation is, Abraham lies and schemes to win the favor of an ignorant and benevolent Pharaoh. Yes, inscrutably, Abraham is protected. Yes, God’s plan prevails. But Abraham brings a curse on Pharaoh for through his own deceit, and attempt to provide apart from God’s plan. In a bizarre Exodus, Abraham is brought out of Egypt, delivered from his own fault alongside blessings his works did not deserve. In his first response to the call of God Abram fails in response. Pharaoh asks the same question that God asks Eve in the garden, “What is this you have done” (Gn. 3:13). Abraham, like Eve, had no response. He has only silence. And Sarah, core to the scene and prominent in the Genesis narrative, here, is completely silent. Abraham is a picture of faithful response, worthy of emulation by all seeking to journey unto holiness. He is also an example of the reality of human faithlessness. Entrusted with a great promise, our faithfulness or faithlessness affects not only us but those around. Just as Sarah is silenced, so was William Carey’s wife—Dorothy Carey. Historian Ruth Tucker noted Carey’s concern for his work, the mission to which he was called, could leave casualties. She noted women like Dorothy, as throughout much of history, had little agency. Part of the nature of the Careys’ relationship included the realities of the day. As Sir William Blackstone said: “The husband and wife are one, and the husband is that one.” William’s decision to go abroad came suddenly—not at home with Dorothy at his side, but at a Baptist Missionary meeting. While in India, Dorothy had another child, her sister married robbing her of companionship, her five-year-old son, Peter, died and she became increasingly prone to delusions. Several years later, she was confined to a room in the house. Carey poured hours into his translations while, as one observer said, “an insane wife, frequently wrought up to a state of most distressing excitement, was in the next room” locked inside. She came hardly of her own will, and suffered a complete breakdown. Christians themselves are confronted with the blessed and marred examples, past and present. We stand on the shoulders of giants, yet those giants are not giants simply because they are paragons of virtue. 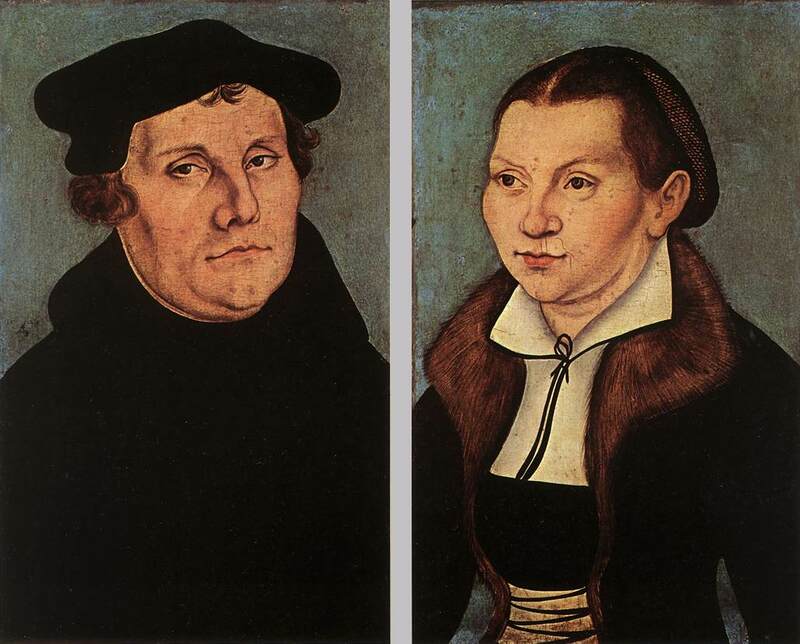 It is All Saints Day, it is also the 500th anniversary of the Reformation. We’re faced with questions: what of these figures, our sordid and sanctified forebearers? In Abraham and Carey, we see both the great fruits of faithfulness extend generations beyond their lives. We also see their own concerns, their reliance on their own efforts, trap others and even curse them. Similarly, we cannot ignore the antisemitism of Luther, or the various and horrible wars and killings of perceived heretics on all sides of the Reformations. This day is All Saints Day Eve, and All Saints are Sinners. God is not a stranger, nor, frankly all that surprised by human failing–the sins of women and men– as much as God hates Sin. We face twin temptations, equal and opposite possible faults. Either we ignore the faults of those who came before and fall into ancestor worship. Or we ignore what they have to teach us completely, and engage in chronologically snobbery and, invariably, worship of the present. We can afford neither. The notion of simul iustus et peccator simultaneously a sinner and justified should be applied to the Luther, the Reformers, and all of us. As Paul says, “Abraham believed God, and it was reckoned to him as righteousness.” 4Now to one who works, wages are not reckoned as a gift but as something due. But to one who without works trusts him who justifies the ungodly, such faith is reckoned as righteousness.” Let there be no mistake, it is not just those in the past in danger of silencing others and imposing our will to supposedly achieve God’s ends. No, it is all of us who need to be reminded of this heart of Evangelical faith: God rectifies, justifies, not the righteous but the ungodly. God speaks life, and speaks eternally the eternal word, God provides Sarah and Abraham a name, a son, a nation, and makes them a blessing; and this blessing has come to us in the Father’s own Son who did all that was necessary and himself was the perfect sacrifice who was obedient in our place where we could not and did not—obedient in life and death, even death on a cross. Jesus established a new people, a new covenant, a church. With no fewer problems now than in the past, and no less cared for, love, and no less under the liberating bonds of grace. As Theologian Stephen Holmes clearly lays out, Baptists generally accept the Reformation objections have objected to the cult of saints: the idea that those undergoing purgation intercede for the church and can be called upon. Yet, we still have our own Sanctoral of sorts– our own “saints”. Beyond Foxe’s book of martyrs, or Lottie Moon’s offering, or the stories of Carey, we have memories in our churches. In San Antonio, you find art commemorating the first mass celebrated. Across the street, at 7th and James Baptist Church where I serve, you find a plaque commemorating the first sermon ever preached. We have institutional memory! Imagine moving a couch in any Baptist church youth room. Someone may well comment about it, and tell you exactly who donated it and when! As Holmes notes, perhaps our notion of Holiness, as saints in covenant to walk together and watch over each other, entails remembering not just individuals of prominent status but entire communities. All Saints day is a fine occasion for remembering, as is the 500th anniversary of the Reformation, but so is Church anniversary. In the Gospel of Luke, we are reminded of this example of Abraham. In the healing of a crippled woman, cursed for 18 years, called by Jesus a “daughter of Abraham.” Lazarus, not the rich man, in Luke is the one who is with Father Abraham. The outsiders are blessed through him. Zacchaeus, the tax collector too is called the “son of Abraham.” Abraham is the prototype of all the disciples who forsake everything and follow (Mark 10:28). We too may be daughters and sons of Abraham by faith. Simultaneously justified and sinner. Following in the footsteps of faith, and heeding the warnings of forcing our wills over God’s own—and, hopefully, by God’s grace, resisting the temptation to secure our prominence, security, and blessing by silencing, deceiving, or overpowering our neighbor. When Peter and John healed a man in Solomon’s portico, they responded to baffled, crowd “You are the descendants of the prophets and of the covenant that God gave to your ancestors, saying to Abraham, ‘And in your descendants, all the families of the earth shall be blessed.’ When God raised up his servant, he sent him first to you, to bless you by turning each of you from your wicked ways.” (Acts 3:25-26). It is through Abraham’s descendent we have been blessed. All ungodly Saints are called onto a journey of Holiness, revealed by faith and for faith in Christ: absolute promise, and a sure gift. God spoke to Abraham, so Abraham went. God speaks today, what will you do? Walter Bruggeman has approved especially instructive particularly in his preaching commentary: Brueggemann, Walter. Genesis: a Bible commentary for teaching and preaching. John Knox Press, 1982. Tucker, Ruth A. “William Carey’s Less-than-Perfect Family Life.” Christian History, 1992, http://www.christianitytoday.com/history/issues/issue-36/william-careys-less-than-perfect-family-life.html. “A Baptist Sanctoral Cycle?” Shored Fragments , The Blog of Stephen R. Holmes, 15 Aug. 2011, steverholmes.org.uk/blog/?p=697.